For the small minority of readers unfamiliar with the game, the premise of SCB is exceedingly simple. A small variety of baddies descend from a hole in the top of a single game screen, an arena of sorts with floating platforms (that inevitably reminds me of Bubble Bobble for some reason.) 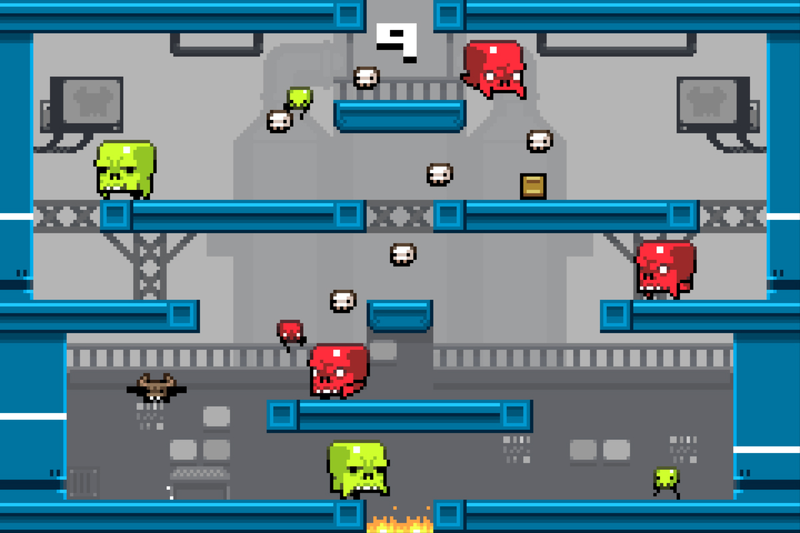 These baddies - two of which resemble the evil green monster from the Exidy classic Venture, and the other a meandering flying skull - saunter down the platforms intent on killing you during the trip. You, the player, are tasked with three things: crate collecting, baddie slaying, and survival. 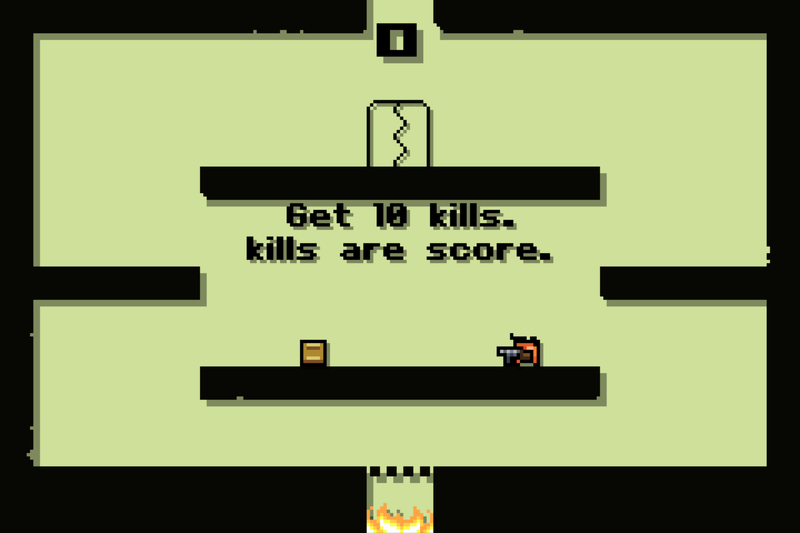 Crates serve as score in SCB; there are no direct rewards for time survived or enemies killed. Each crate collected yields a random weapon for your character to brandish. These armaments range from the virtually useless pea-shooter handgun to the almighty laser rifle, with others thrown in such as the melee-only katana and destructive grenade launcher. Additional weapons and characters are unlocked as you play and collect more crates, but beware - the more crates collected, the more dangerous and frantic the stage becomes. You see, the enemies get pretty pissed if you don't whack them on their first trip through the stage. I think I'd be rightly miffed as well if I had to pass through a red-hot fire pit (each stage has one. It will kill you too, so don't fall in.) When this happens, the baddies move super fast and are super angry, requiring the player to be extra quick on their feet and their triggers to survive. This is where the true devilish nature of SCB rears its ugly head. As the monsters travel towards their fiery destination, the player has to find a way to not only avoid (and destroy) the beasties, but also collect crates that pop up in random locations. Sometimes these crates spawn right next to the player - and sometimes they spawn directly under the monster hole. The game makes no concessions, and the aspiring Super Crate Box pro must deal with whatever hand he or she is dealt. This goes for the weapons, too. 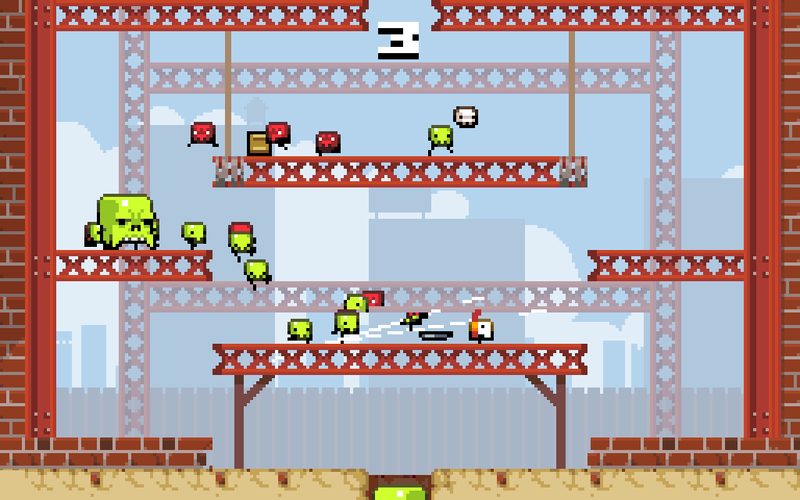 Although a rocket launcher might have done nicely to properly clear the crowded stage of angry green gremlins, the crate decides to give you the finger and spew out a katana. Too bad, so sad. As such, many hours of my well-earned free time have been spent cursing at my iPad and clacking away on my keyboard, a slave to the habit-forming gameplay that forces you to dynamically adjust your choices and play style based on the current enemy and armament situation at a breakneck pace. To this end, Super Crate Box is an arcade masterpiece featuring a distinct style, fun music, ultra-precise twitch gameplay, and instant accessibility. 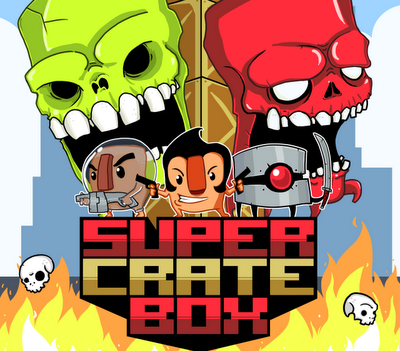 Super Crate Box is freeware and is available for download for PC or Mac, or free to play on Steam for PC. It can also be played on the PS Vita or PlayStation Store certified phones and tablets as well as iOS. I'd personally recommend the Super Crate Box Special - you can snag a new soundtrack for the game composed by Phlogiston, as well as the game remastered to include that soundtrack instead of the original. Download the free PC/Mac version of the game here (from the Super Crate Box website). Download the free PC version of the game here (through Steam). Purchase the Super Crate Box (Phlogiston Remix) here (from Bandcamp). Purchase the iOS version here (from the iTunes store). I have to confess that when Vlambeer's Super Crate Box was first released I took heed of the wise words of Flavor Flav and purposely avoided it due to the insane mega-hype surrounding its launch. Hailed by many at the time as the best indie game ever (and so on), I decided that rather than getting caught up in all the excitement I'd come back to the game a few months later when things had calmed down a bit. In hindsight, my decision to ignore the game was a bit foolish. You see, not only is SCB a beautifully designed game, but it's also incredibly fun and rewarding (at least intitially as you unlock the levels, weapons, characters and game modes. Sure, the fact that it is written in spaghetti-style GML code is still evident today, with some minor yet long-standing bugs and glitches still present, but nonetheless it has stood the test of time well - a fact that is evident from the simply ridiculous total number of crates collected (and still counting) since its launch two years ago. Peter's review pretty much nails it, despite not mentioning some of the other versions of the game that exist - such as the April fools day 'bug-fixed' build of the game (in which you gain points for killing enemies instead), the forthcoming C64 port and - of course - the Winnitron exclusive two player version. 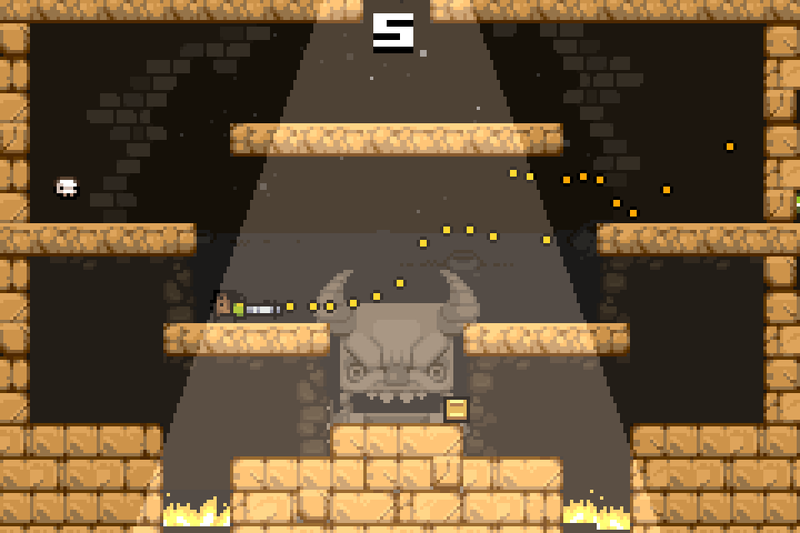 Curses Vlambeer, must you really insist on not publicly releasing what must be the ultimate version of this game?! If the scoring was up to me SCB would have received a straight 5/5, but Peter is right in stating that the experience of playing the game does sometimes feel more compulsive than actually 'fun'. It's just too easy to become trapped in a loop playing over and over, with the minutes turning into hours as you battle to collect crate after crate after crate... After seeing the glazed, wholly-addicted expressions on players faces at Play Expo last week I'm still not completely convinced that this is a good thing.